Try it with a cup of coffee or tea! Heavenly. Prepare a pastry for a nine-inch pie plate. Roll, trim, and flute the edge. You can cut out little leaves of dough and press them on there, but that might be over-achieving. For the filling, beat the pureed squash/sweet potato/ pumpkin with the dairy, vanilla and eggs in a mixer or food processor until combined. Add the sugar, cinnamon, salt and spices and mix until well combined. Pour filling into pastry shell and cover the edges of the crust with foil or a pie-crust protector. Bake at 375 degrees for 25 minutes, remove the foil, and bake another 20 -25 minutes more. You can tell it’s done when you insert a butter knife into the custard, about two inches in from the edge, and the knife comes out clean. The custard in the very center should still jiggle some. Cool on a rack for a couple hours, and then refrigerate. Serve with homemade whipped cream. How do you make that? No, don’t get a can and squirt. Get a carton of liquid whipping cream. A pint makes a lovely mass. Add about a tsp. of vanilla, and 3-5 Tablespoons of powdered sugar (I prefer mine not too sweet). Beat in a mixer until it’s light, airy, and clings to the spoon. Do NOT over beat, or you will have sweet, vanilla butter. 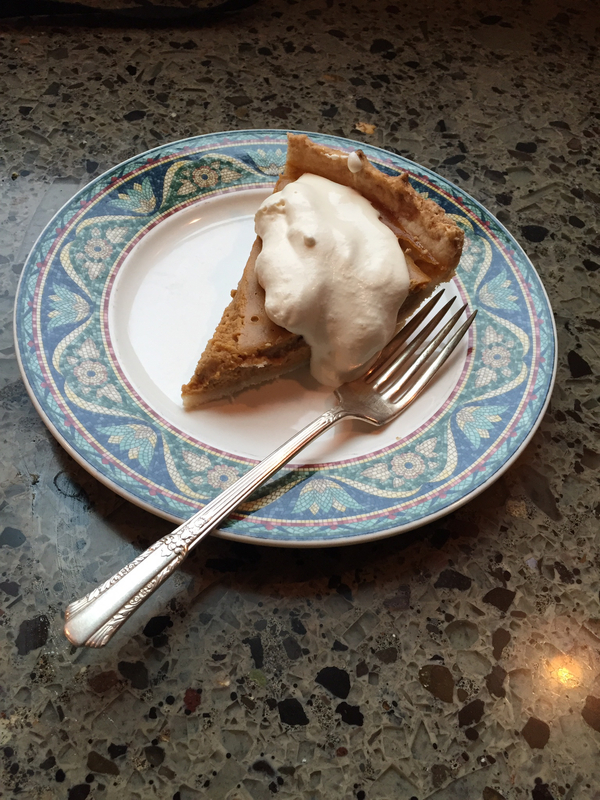 *Butternut squash makes much better pumpkin pie than pumpkin, trust me. But if you don’t have it, or don’t feel inclined to bake a squash, take out the seeds, scoop and puree the pulp with a bit of water, then you are allowed to buy a can of pumpkin, or cook yourself up a sweet potato and mash it with a little water so that you have two cups. Mmmm! This recipe sounds delicious! So inspiring to make a healthy dessert!